The pace of Indian consumer price inflation is hovering just above a two-decade low, driven by the combination of subdued commodity prices and relatively disciplined fiscal policy. Even as India's GDP continues to grow at the fastest pace of any major economy, muted inflationary pressures have cleared the way for two successive interest rate cuts by the central bank in recent months. More to come on this topic in an upcoming dispatch. Click here to return to the homepage. As recently as 2014, India's GDP (measured in current, a.k.a. "nominal", dollars at market exchange rates) ranked tenth globally. Having overtaken Russia, Italy, and Brazil over the past four years, India is on track to eclipse both the United Kingdom and France in 2019 to become the world's fifth-largest economy in current dollars. 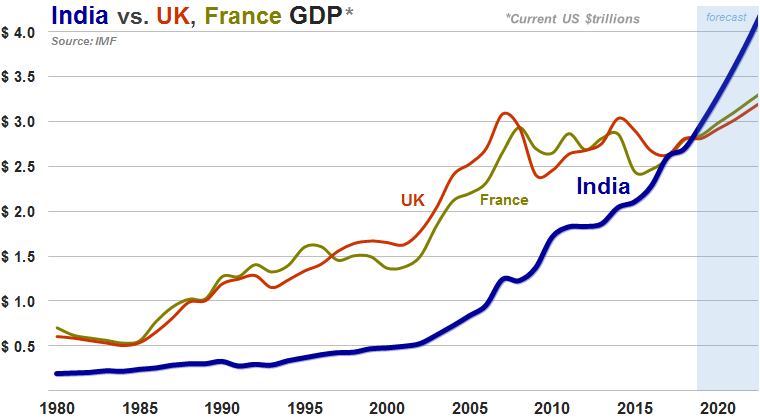 On a purchasing power parity basis (i.e., adjusted for differences in the cost of goods and services), India's economy is already larger than those of Germany, the UK, and France combined. More to come on this topic in an upcoming dispatch. 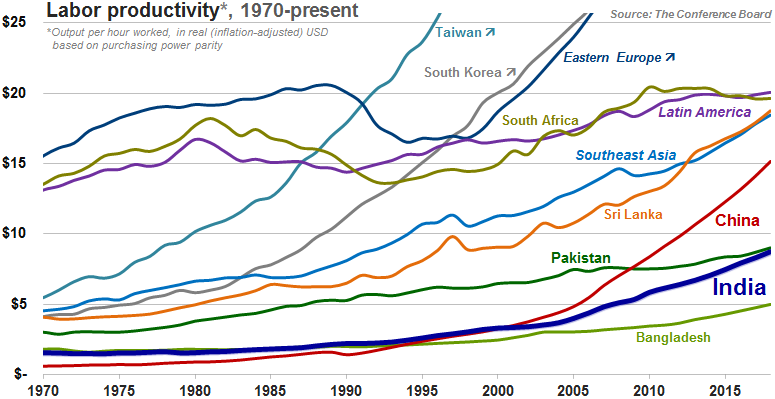 India’s productivity growth has significantly lagged that of China over the past couple decades, in large part due to a web of interrelated legal restrictions, market distortions, and counter-productive incentives that have warped the Indian economy’s allocation of resources and stifled the potential of the country’s workers and businesses. For more on this topic, check out the India's unfinished revolution dispatch. 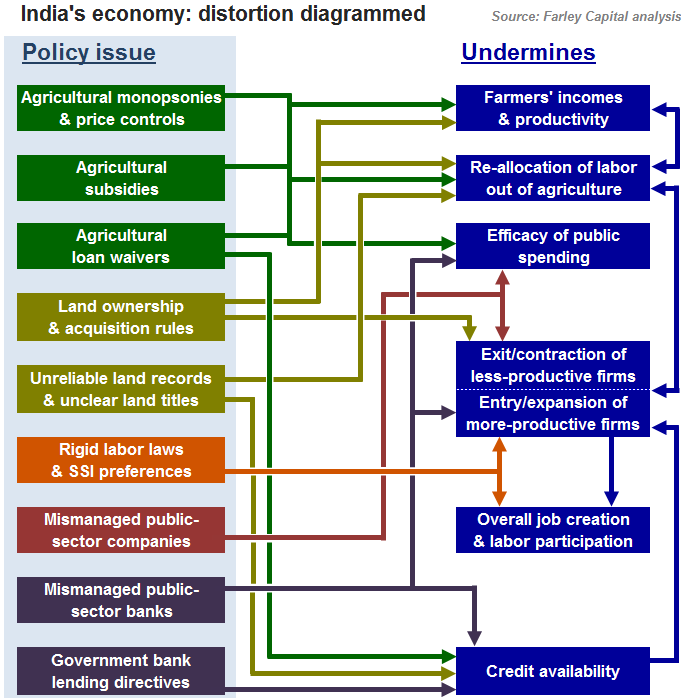 Because India’s agricultural sector, land market, labor laws, and state-owned companies form a Gordian knot of interconnected dysfunction, solving any of these areas’ problems requires reforming all the others, as well. Can't see dispatch below? Click here to download PDF. Previous dispatches provided a chronology of the lead-up to India’s 1991 crisis (“India before 1991: tiger caged”), examined the reforms unleashed by that year’s events (“India since 1991: tiger uncaged”), and explored India's highly favorable demographics ("Demographics").